After you’ve created an Excel 2007 table (using the Table button on the Insert tab), you can choose from several methods for adding records to the table. Before you add records, the range must already be formatted as a table. 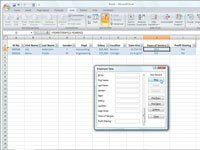 To format a worksheet range as a table, select a cell in the range and then click the Table button on the Insert tab. The most direct way to add new data is to press the Tab key when the cell cursor is in the last cell of the last record (row). Doing this causes Excel to add another row to the table where you can enter the appropriate information for the next record. 1Click the arrow at the right end of the Quick Access toolbar and select More Commands. 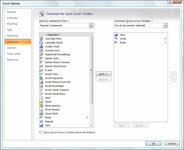 The Excel Options dialog box appears with the Customize options displayed in the right pane. 2In the Choose Commands From drop-down list, select All Commands. You’ll see a long, alphabetical list of all the commands available in Excel. 3Select the Form button in the list box, click Add, and click OK. The Form button appears at the end of the Quick Access toolbar. 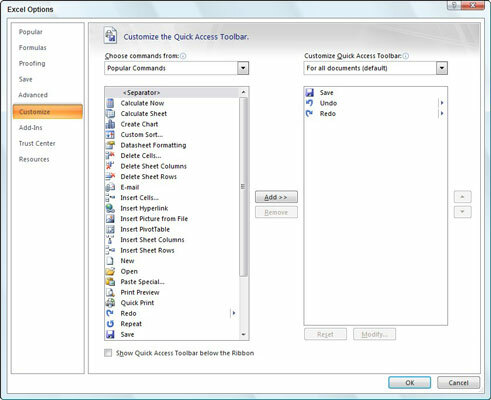 4Position the cell cursor in the table and click the Form button on the Quick Access toolbar. The data form lists the field names down the left side of the form with the entries for the first record in the text boxes next to them. 5Click the New button in the data form. Excel displays a blank data form, which you get to fill in. 6Type the information for the first field and press Tab to move to the next field. 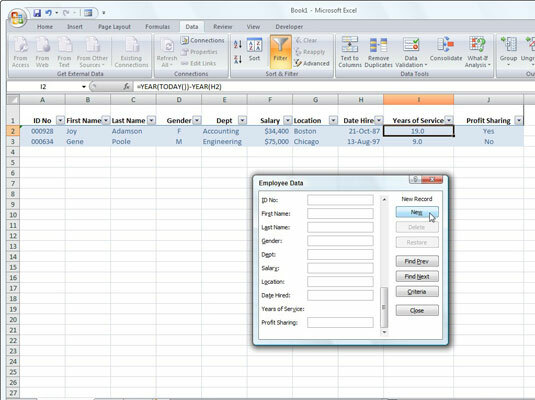 Continue typing data for each field in the record. 7Press Enter to complete the record. Excel adds the record to the table and displays another blank data form. 8Press Esc or click the Close button when you finish adding records. Your table will be updated with the new records.